A colleague and I were recently meeting with a CEO and his leadership team, observing them as they discussed how to improve their annual planning process. As the team of ten explored their current process, the conversation got heated. The team had been talking for 45 minutes, but it wasn’t clear who was leading the discussion or what their objectives were. Many comments were off-topic, and they were not getting closer to answers. We paused the meeting and posed this question: How are you reacting to this conversation and what in youis causing your reaction? We were met with blank stares. They asked us to repeat the question, seemingly surprised that we had asked them to take responsibility for their reactions. Surely, we had meant to ask them what everyone elsewas doing wrong in the conversation, right? Leaders and teammates often tell us that their team is “dysfunctional” (their word, not ours) and ask us to help identify and fix the issue. When we dig deeper and ask them to describe what they are observing in detail, we typically hear that certain team members are problematic and need to change their behavior. We also hear vague statements about “them” (everyone else) not knowing how to operate effectively. As experienced team development practitioners, we know that these are not accurate or helpful assessments of the situation. Teams are complex systems of individuals with different preferences, skills, experiences, perspectives, and habits. 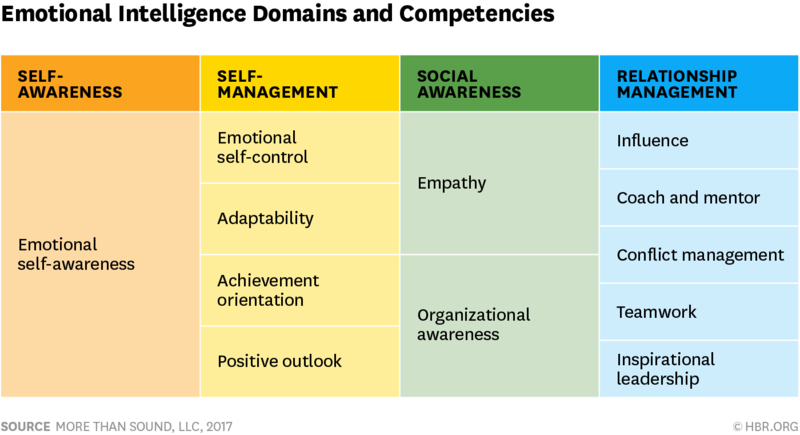 The odds of improving that complex system in a meaningful and sustainable way are higher if every team member — including the leader — learns to master these three foundational capabilities: internal self-awareness, external self-awareness, and personal accountability. I once asked an executive I was coaching how he was feeling about a challenging situation. He replied, “You mean my emotions? I’m an engineer and I don’t think about emotions.” He then changed the subject. This executive lacked internal self-awareness. Internal self-awareness involves understanding your feelings, beliefs, and values — your inner narrative. When we don’t understand ourselves, we are more likely to succumb to the fundamental attribution error of believing that the behaviors of others are the result of negative intent or character (“he was late because he does not care”) and believing that our own behaviors are caused by circumstance (“I was late because of traffic”). Teammates with low internal self-awareness typically see their beliefs and values as “the truth,” as opposed to what is true for them based on their feelings and past experiences. They can fail to recognize that others may have equally valid perspectives. Let’s look at another example: Manuel, a low internal self-awareness leader, and his colleague, Tara. In a product planning meeting, Tara, a big picture thinker, says, “We need to think of this plan in the context of our broader strategy.” Manuel, an execution-focused leader, has an unconscious reaction of anger and frustration. He would rather focus on the detailed plan and the execution. But rather than recognizing his different thinking style as the cause of his discomfort and the root of his belief that strategy is unimportant, he concludes privately that Tara doesn’t understand the situation, is annoying, and is not the right person for this project. He later tells another colleague she should be taken off the team. This is a loss for everyone. Tara is misunderstood, devalued, and possibly dismissed. Manuel doesn’t broaden his perspective or learn how to operate with people who think differently than he does. The good news is that internal self-awareness can be learned. To start, you — as a leader of the team or a teammate — can pause, reflect, and consider your responses to these questions when you find yourself in challenging or emotionally-charged scenarios. What emotions am I experiencing? What am I assuming about another person or the situation? What are the facts vs. my interpretations? What are my core values, and how might they be impacting my reactions? External self-awareness involves understanding how our words and actions impact others. Most of the leaders and teammates we work with have no idea how their behaviors are impacting their colleagues. As a result, it’s difficult for them to recognize and leverage the strengths that make them a productive teammate, as well as identify and correct behaviors that negatively impact the team. Without this knowledge, they can’t improve. One way to start building external self-awareness is to observe others’ reactions during discussions. Did someone raise their voice? Stop talking? Gesture? Sit back from the table? Smile? You can collect some valuable information this way. You should also be mindful of the fact that you will reach some inaccurate conclusions. In these situations, remember that you are interpreting why colleagues react the way they do, and those interpretations will be influenced by your personal beliefs and experiences. Paying attention to your internal self-awareness and considering how you reached your initial conclusions will help. What am I doing in team meetings that is helpful? What am I doing that is not helpful? If you could change one part of how I interact with the team, what would it be? This may feel risky and uncomfortable, but it’s the only way you can get accurate data about the impact of your words and actions. In terms of timing, you should carefully assess whether it is additive to the discussion at hand to ask for feedback in the moment, or whether it is better to ask later. For example, in a one-on-one conversation with a trusted colleague, it’s probably OK to pause and ask. However, in a big team meeting, pausing the conversation to get personal feedback can be disruptive to what your team is trying to accomplish. When we think of accountability, we typically think of holding others accountable. But the most effective leaders and teammates are more focused on holding themselves accountable. Like self-awareness, this sounds easy, though it rarely is. When confronted with a challenge or discomfort, many of us have established unhealthy patterns: blaming or criticizing others, defending ourselves, feigning confusion, or avoiding the issue altogether. If a team is not working well together, it’s highly likely that every team member is contributing to the difficulty in some way, and each of them could be taking personal accountability to make the team more effective. Recognize when there is a problem. Sometimes this is the hardest part because we’d rather look away or talk about how busy we are instead. Resist the urge to do so. Accept that you are part of the problem. You are absolutely contributing to the situation. Take personal responsibility for solving the problem. Stick with it until the problem is completely solved. Going back to the example of Manuel — if he were practicing personal accountability, he would have first recognized that he had some conflict with Tara that was impacting the team’s ability to create a solid plan. He would have then had the mindset to accept that he was contributing to the conflict, committed to working on a more productive relationship with Tara, and avoided the temptation to jump to conclusions and talk behind her back. A small shift in mindset will directly impact behaviors and can have a significant positive impact on an entire team. Explore her reactions by considering her emotions, beliefs and values, and asking herself what in her is causing this reaction (internal self-awareness). Consider the impact she may be having on others by observation or inquiry (external self-awareness). Assess how she is contributing to the situation and make a conscious choice about how to react to improve the team’s outcomes (personal accountability). Most teams we work with learn to operate more effectively by building and strengthening these three capabilities over time. Changing how we process information and respond requires not just learning these new skills, but also demonstrating them long enough to form new habits. Effective teammates believe that, sometimes, you have to go slow to go fast. They invest the time and energy needed to build these foundational skills, so they can be better at tackling the difficult business opportunities and challenges that they face. It’s a dreadful moment when a well-liked member of your team tenders their resignation. You experience a cocktail of emotions ranging from fear about how the rest of the team will react, to frustration at having to add recruiting to your already hectic calendar. The worst is the lingering feeling of being rejected. As with most difficult situations as a manager, how you handle the resignation will affect more than just you. How you respond will influence whether the person’s departure becomes a typical bump in the road or the inflection point to a downward trend for your team. Before sharing the news with anyone, take some time to consider your response carefully. This allows you to grapple with your own reactions before you’re forced to manage those of your team members. If you move too quickly and try to communicate a positive message while harboring anxiety, frustration, or bitterness, those potent emotions will show through in your body language. When your words are positive but your body language telegraphs concern, your team will notice the incongruence and infer your intent from what you’re showing rather than what you’re saying. Once you’ve reflected on your own reaction, you can work through a process that will minimize the damage of a well-liked team member resigning. Start by helping everyone celebrate the person who is leaving. It’s understandable if you feel like downplaying the person’s departure, in hopes that no one will notice. It just isn’t likely to work. Losing a well-liked colleague will create concern and even grief for your team and invalidating that grief removes an important part of the process. Letting the person slip out the door unheralded will suggest that you don’t care. Don’t make the mistake of minimizing the moment. Instead, be at the front of the “we’ll miss you” parade. Throw a party to wish the person well. Say a few words about some of the great things the person contributed to the team. Laugh about inside jokes and shared experiences because, as you do, you’ll not only make the person who’s leaving feel good about your team, you’ll strengthen the bond among the people who remain. Recalling these stories will also put a smile on your face, which is much better than the look of terror that might be associated with your inner voice that’s saying, “What will we do without her?” or “What if others start to follow suit?” That face will only make your team more nervous when they’re looking to you for reassurance. Your words and body language should convey that it’s normal and natural for people to move on. Once you’ve thrown the party the person deserves, ask them for a favor in return — their candor about what you need to learn from their departure. Even if your organization has a formal third-party exit interview process, conduct your own interview. Ask the person to be honest with you as part of the legacy they can leave in making you and the team better in the future. Prepare your questions carefully and get ready to take the lumps. You’ll need to have good questions and follow-up prompts to get past the pat answers such as “I was offered higher compensation” and “It’s an opportunity I couldn’t refuse.” You need to identify what factors contributed to the person taking the call from the recruiter in the first place. You can make these questions less pointed by asking, “What advice would you give me to prevent another great person like you from taking a call from a recruiter?” “What do I need to know that people aren’t telling me?” “How could I improve the experience of working here?” By making the questions more generic and less personal, the departing employee might feel more inclined to share any uncomfortable truth. You can also seek feedback about things beyond your control, such as, “What other messages does the company need to hear?” “What factors would contribute to a better experience here?” Throughout the discussion, your emphasis should be on asking great questions. Do as little talking as possible and instead, listen carefully and objectively. After the exit interview, your head will be full of powerful, sometimes conflicting thoughts and feelings. Give yourself a night to sleep on it and then start the process of putting your insights into action. First, lean into the uncomfortable conversations. Whether one-on-one or in team meetings, dig into any themes that have merit. Share your hypotheses and ask people to clarify, refine, validate, or challenge how you’re thinking. For example, you could say, “I’m coming to understand that the biggest problem is not the workload, but the lack of focus. What do you think? Is it true, false, or only half the picture?” This process of generating and testing hypotheses will not only help you make the most targeted changes, it will also help you strengthen the connection with your remaining team members. As you listen to their responses, go beneath the facts and information they’re sharing with you and watch and listen for what they are feeling and what they value. Where does their language become stronger (e.g., “we always do this,” or “never do that”), suggesting that they are frustrated or angry. Where does it become weaker (e.g., “I guess we…, or “I think sometimes we might”), hinting that they might feel hesitant or powerless. What is their body language telling you? When you spot an emotional reaction, ask a few more questions to understand what’s beneath their feelings. Through all of these conversations, try to discern whether one great person resigning was a single point or the start of a pattern. Be open about what you can do differently and advocate for the changes from other stakeholders that will make your team a better one to work on. The insights you glean from conducting your own exit interview and testing your hypotheses will be valuable, but don’t lose sight of the most important ways that you contribute to the morale of your team — by positioning them to do meaningful work. Double down on the management essentials. Make sure everyone is clear on your expectations, especially on the highest (and lowest) priorities for the team. Have frank conversations to ensure people feel like they have the requisite skills and resources to do their jobs well. And pay more attention to the feedback, coaching, and celebrations that will motivate them and keep them engaged. If there was a problem on your team you were unaware of (or trying to ignore) it might take losing a well-liked employee for you to recognize the severity of the issue. Work through your emotions and then start a virtuous cycle by celebrating the departing employee, seeking their candid feedback in an exit interview, forming and testing hypotheses about how to improve your workplace, and making meaningful changes that make your team feel heard and valued. Losing one team member might end up being a relatively low price to pay if it leads to better morale all around. It seems everywhere you look these days someone is touting the benefits of mindfulness — a practice that Jon Kabat-Zinn, the founder of Mindfulness Based Stress Reduction, describes simply as “paying attention in a particular way; on purpose, in the present moment and non-judgmentally.” Research shows that people who practice mindfulness are less stressed, more focused and better able to regulate their emotions. But, if you’re a busy working parent, how do you build mindfulness into an already-packed day? Those of us with kids and jobs often feel tired and rushed. We’re constantly multi-tasking, juggling personal and professional responsibilities, and feeling stressed about all we can’t get done. According to a Pew Research Center analysis, 56 percent of working parents say they find it difficult to balance their time between work and family. Though I now counsel others on how to break this cycle, I can certainly relate to it. Years ago, I worked as Twitter’s head of learning and development when the company was growing 350% year after year. It was like being on a rocket ship, and I loved the work. But I found myself struggling to stay connected to my family. I can remember the afternoon my son’s school called to make me aware that no one had come to pick him up. He was in first grade at the time, and I burst into tears. Start by spending a few minutes writing down what you do each day. It might look something like this: wake, coffee, family breakfast, pack lunches, prep for school day, walk dog, shower for work, drive car, train ride, walk to office, work all day, walk to train, car ride home, dinner, bath time, family reading or games, bedtime. Coffee: Make sure to pause before the first sip. Smell the aroma, feel the heat of the mug on your hand, and take three intentional breaths. Now enjoy. Train ride: Once you’re settled into your seat, set a timer for five to ten minutes and practice mediation. Sit in silence and focus on your breathing or use a mindfulness app on your phone to listen to a guided meditation. Your eyes can be open or closed depending on the situation and what feels safe or comfortable. Work: Each time you sit down to your computer, take a pause. Close your eyes, notice the sensation of your feet on the floor, your body in your chair, feel your breath come in and out of your body. Continue with your day. Dinner: As you are preparing the meal, spend a moment reflecting on where the food came from. Imagine who planted it, picked it, or drove it to the store where you purchased it. On occasions when your entire family is sitting around the table at the same time, take a moment to feel grateful. Bedtime: Decide on a ritual that cultivates mindful awareness. For younger children, consider having them put a stuffed animal on their belly as each of you count how many times the animal rides up and down with their breath. If your children are older try a head, heart, gut check-in at bedtime. Is the mind busy or calm in this moment? Are any emotions present or lingering from the day? Is there anything that needs to be shared or said that has not been already? Does mindfulness seem a little more doable now? Research indicates that it takes just eight weeks of relatively regular practice to make positive changes to the brain. But if we wait until we have enough “bandwidth” to devote big blocks of time to it, we may never start. For working parents, my advice is to instead insert just a few small moments of mindfulness into your day, even — and especially — when life seems too busy, hectic and out of control. Michelle Gale is a mindful parenting educator and a former head of learning and leadership development for Twitter. She is the author of the new book Mindful Parenting in a Messy World (Motivational Press, 2017. We all have life events that distract us from work from time to time — an ailing family member, a divorce, the death of a friend. You can’t expect someone to be at their best at such times. But as a manager what can you expect? How can you support the person to take care of themselves emotionally while also making sure they are doing their work (or as much of it as they are able to)? Managing an employee who is going through a stressful period is “one of the real challenges all bosses face,” says Linda Hill, professor at Harvard Business School and author of Being the Boss. Most of us try to keep work and home separate, but “we all have situations in which our personal and professional lives collide,” and how you handle these situations with your employees is often a test of your leadership. You need to be empathetic and compassionate while also being professional and keeping your team productive. It’s a fine line to maintain, says Annie McKee, a senior fellow at the University of Pennsylvania Graduate School of Education and author of How to Be Happy at Work.Here’s how to manage an employee going through a personal crisis. “People don’t always feel comfortable telling their boss” that a parent is gravely ill or that they feel stressed out in the wake of a crumbling relationship, says McKee. They may be too overwhelmed, or embarrassed that it is causing them to be late repeatedly or to miss deadlines. Often a manager’s first challenge is simply recognizing the warning signs that an employee is going through a difficult time. Invest time in building good relationships with employees so you’ll be able to detect any problems early on. If you maintain an atmosphere of compassion in the office, people are more likely to proactively come to you when they’re going through a tough period. As a leader, you need to be able to show empathy and care, but you also must avoid becoming an employee’s personal confidante. After all, your job as manager is not to be the office shrink. So don’t ask a bunch of questions about the employee’s problems. As the person with more power in the relationship, the employee may feel compelled to tell you more than they’re comfortable with. “You want to build a caring relationship with employees, not a friendly relationship,” says Hill. Many managers make the mistake of confusing being liked with being trusted or respected. A good manager “has the ability to read and understand other people’s needs and concerns,” says McKee, while still keeping everyone focused on the major task at hand: accomplishing work. When you speak to an employee about their current struggles, “listen first instead of immediately advocating for some particular course of action,” says Hill. They may just want a sounding board about the difficulties of caring for a sick relative or an opportunity to explain why a divorce has affected their attention span. If you immediately suggest they take a leave of absence or adjust their schedule, they may be put off if that’s not what they were thinking. Instead, ask what both of you can do together to address the issue of performance during the difficult period. “Try to use the word ‘we,’” advises Hill, as in “How can we support you?” The employee may have an idea for a temporary arrangement — some time off, handing off a project to a colleague, or a more flexible schedule for a few weeks — that is amenable to you. You may be more than willing to give a grieving employee several weeks of leave, or to offer a woman with a high-risk pregnancy the ability to work from home. But the decision isn’t always yours to make. “You may be very compassionate but you may be in a company where that’s not the way it works,” says Hill. Of course, if you have the leeway to get creative with a flexible schedule, an adjusted workload, or a temporary work-from-home arrangement, do what you think is best. But also be sure you understand your company’s restrictions on short- and long-term leave, and what, if any, bureaucratic hurdles exist before promising anything to your employee. Explain that you need to check what’s possible before you both commit to an arrangement. If the employee needs counseling or drug or alcohol services, there may be resources provided by your company’s medical insurance that you can recommend. But investigate the quality of those resources first. “The last thing you want to do is send a suffering employee to avail themselves of a program or supposedly helpful people who then fall short,” says McKee. Be conscious of the fact that other employees will take note of how you treat the struggling colleague and will likely expect similar consideration if they too run into difficult times in the future. “If you want to get productive work out of people, they need to trust you and believe that you’ll treat them fairly,” says Hill. Remember that policies may be precedent-setting. Every situation will be unique, but you want to be comfortable with policies in case you are called to apply them again. Keep in mind that solutions could apply to “the next person and the next and the next after that,” says McKee. Set a tone of compassion in the office. It will not only give your employees confidence to approach you with struggles, but also give you the ability to spot warnings signs. Alicia Shankland, a senior HR executive with more than 20 years of experience, managed two different women through the intensely stressful, emotional months of fertility treatment. In both cases, the treatments continued for nearly a year, so the women were away from work frequently for medical appointments and procedures. They also experienced severe ups and downs from the hormone drugs and the emotional devastation of miscarriages. What’s more, the schedule of fertility treatments didn’t fit neatly into any of the existing standard HR leave policies. “There was no way to make a 30-60-90 day plan to accommodate all the unknowns,” Shankland said. In each case, she endeavored to make as many allowances as possible, and the women used sick time, flex time, and personal days. She worked with each of them to set concrete, realistic work goals that allowed them to focus on the most critical deliverables while delegating other duties, and teammates pitched in to make sure duties weren’t neglected or dropped. “We managed through it as a tight-knit team,” she says. David recognized that it would be better to offer the woman more flexibility, a shift she happily embraced. The management team restructured her job away from her responsibilities in client services, which demanded high close rates and availability, to duties that weren’t as time sensitive. “This provided our team with less reliance on her and also gave her the freedom to focus on her important family matters that were the priority,” he said. She also agreed to switch her compensation from salaried to hourly, which allowed the firm the flexibility to carry on the arrangement indefinitely. Daniel Goleman is Co-Director of the Consortium for Research on Emotional Intelligence in Organizations at Rutgers University, co-author of Primal Leadership: Leading with Emotional Intelligence, and author of The Brain and Emotional Intelligence: New Insights, Leadership: Selected Writings, and A Force For Good: The Dalai Lama’s Vision for Our World. His latest book is Altered Traits: Science Reveals How Meditation Changes Your Mind, Brain, and Body. Simply reviewing the 12 competencies in your mind can give you a sense of where you might need some development. There are a number of formal models of EI, and many of them come with their own assessment tools. When choosing a tool to use, consider how well it predicts leadership outcomes. Some assess how you see yourself; these correlate highly with personality tests, which also tap into a person’s “self-schema.” Others, like that of Yale University president Peter Salovey and his colleagues, define EI as an ability; their test, the MSCEIT(a commercially available product), correlates more highly with IQ than any other EI test. Daniel Goleman is Co-Director of the Consortium for Research on Emotional Intelligence in Organizations at Rutgers University, co-author of Primal Leadership: Leading with Emotional Intelligence, and author of The Brain and Emotional Intelligence: New Insights and Leadership: Selected Writings. His latest book is A Force For Good: The Dalai Lama’s Vision for Our World.